Djembe history, just like African history in general, is hardly documented in writing. But it is clear that the traditional, sacred rhythms and dances have gone through a dramatic transformation in recent years. The exact beginning of the djembe history and tradition is unclear, but it was certainly present in the 13th century, when the great Mali Empire was formed. Apparently, it has its origins with the Malinke (also called Maninka, Mandinka, Mande) and Susu people, who roughly occupied the area between today's Bamako (Mali) and Kankan (Guinea). The "numu" are a social class of professional blacksmiths and are believed to be the first carvers of this wooden instrument. There is also a story in circulation about the "true inventor" of the djembe: A woman. While pounding millet, she broke through the bottom of her old mortar and mounted a goat skin on it. The goblet-shape of the djembe still reminds of the mortars used by African women. In traditional Africa, often only certain classes of people are allowed to play certain instruments. For instance, the kora, ngoni and bala are reserved to the "jeli", the class of professional musicians (called griots in French). With the djembe, there do not seem to be such restrictions of who may play it. In fact, most famous djembe players come from numu and even noble lineages of the Mande society, who are normally not associated with making music. Through migration of the numu, the djembe is now not only present in Mali and Guinea, but also in the Ivory Coast, Burkina Faso, Senegal and most recently Ghana. Djembe history and drumming in its original environment, the African village, has a purpose. The various rhythms are only played at a certain time for a certain reason. For instance, djembe drumming can accompany the passage into adulthood or marriage. It's also played to honor specific groups of people or professions. While the same rhythm can be played for hours, playful and spontaneous interactions take place: Dancers challenge the drummers to mark their moves, while these may turn up the heat or slow down to allow the participants to sing and catch their breath. "A nation without a culture is a lost nation." To preserve the disappearing traditional culture, governments formed and sponsored National Ballets and Ensembles. Members were sometimes paid to perfect their art. It was the world tours of "Les Ballets Africains" in the 1950s, led by the Guinean Fodeba Keita, that first exposed the djembe to an international audience. Out of this ballet-style, another genre of djembe-playing has evolved. Focus is shifted away from the dancers, while the charisma and virtuosity of the soloist becomes more important. The performances of Mamady Keita and his troupes exemplify this style. Through the ballets and African teachers, the djembe has definitely settled in Western culture. It accompanies popular Western music and drum manufacturers have found profitable markets for industrially produced copies. The therapeutic effect of music is being rediscovered in modern societies and drum circles pop up in every major city. 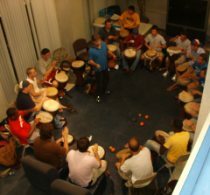 Djembe drumming has become a tool for team building, therapies, self improvement and New Age movements in the West. Africans are certainly proud of their instrument getting some recognition. But many are frustrated to see the djembe being completely removed from its cultural context and to hear the traditional rhythms of their villages not being played correctly. Most Westerners are unaware of the depth, traditional use and purpose of the drum because djembe history is hardly documented. Only few are interested to research on their own. Instead, some foreign visitors to Africa even try to show Africans how the djembe is supposed to be played. The recent djembe history has completely transformed the traditional culture, which is largely ignored in the West. It is up to all fans to show interest and respect towards its origins, so that the depth of authentic djembe drumming can be preserved. This article is based on the information given in Eric Charry's unedited expanded version of the article published in Percussive Notes, vol. 34, no.2, April 1996, p. 66-72. For practical tips and info, read my djembe drum beginners guide.